For the most part, buildings as a whole are relatively static and unchanging as a result of budget constraints and physical limitations. If we imagine a 30 year time lapse video of a typical building, we would see that the building may experience occupant turnover, changes in function, renovation, additions and more. In any case, the physical characteristics of the building as a whole would appear fairly stubborn, while the systems and people using the building would appear to flow through the building like water. Given this static nature of real world buildings, architects can depend on a relatively stable context within which to design. I recently wrote about opportunities for responsive or reflexive architectural characteristics and considered opportunities found within the more immediate experience. But if we zoom out a bit and considering a larger frame of time, and a larger scale, we can see that the entire phenomenon of virtual architecture is more like a liquid than an artifact. Few, if any, virtual constructs have any guaranteed stay power or longevity. The architectural landscape and community fabric is in constant flux; shifting shape and evolving. The most startling experience of this phenomenon was when I was building a virtual model of a design we had created for a real life client using Second Life as a visualization tool. Clear Ink had allowed me to build the project on one of their sandbox islands. However, a few weeks into construction, I purchased my own island, and moved the entire project there. We ended up using the other island to create the Virtual U.S. Capitol Hill, but I had yet to give our client a landmark to the new location. One day, I was building the rostrum of the House Chamber when my client suddenly dropped in from the sky. Imagine his confusion – expecting to rez into his lovely wooded site to visit his soon-to-be-new home, only to find himself in the middle of the House of Representatives! Nothing is permanent in SL, and lasting context is never a guarantee. In this way, virtual architecture, and the context it lives in, differs from physical architecture. It becomes less like a static artifact, and more like a liquid. An architecture truly responsive to its fluid context must be able to shift shape along with it. The same is true for the program and the community it serves. Just like in real life, community is a very powerful force in virtual worlds. Virtual architects have the unique opportunity to actually use their post-occupancy metrics to adjust and rebuild their designs in realtime. 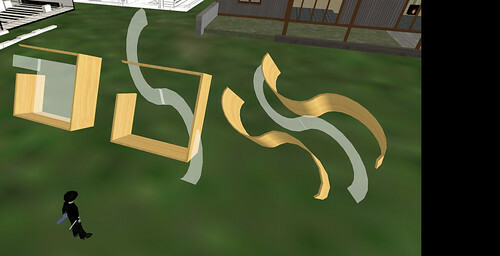 In dense mainland builds, virtual designers have the option of rebuilding portions of their build in response to constant changes in their immediate context. It’s a lot easier and far less expensive to repair and improve virtual architecture than it is to rebuild a real world building. Despite this opportunity, many builds are still treated as though they are static and immovable artifacts. The biggest expense in a virtual build is still generally the initial building effort, just as it would be in building a new headquarters in real life. However, I think the investment in virtual architecture might benefit from being spread out over a longer term, and considered an ongoing experiment, never final. Abandoning a virtual build just because its first iteration fails to draw crowds and effectively serve the community or meet its program needs is a missed opportunity. The entire virtual fabric is one huge learning curve, rife with potential. Perhaps we should be approaching virtual builds with a waste-basket nearby, less reluctant to tear down and rebuild – allowing the architecture to constantly evolve, becoming as liquid, reflexive and ever-changing as the community it hopes to serve. this reminds me of an excellent book, “how buildings learn,” which shows just such a time lapse. the original (or early) form of a structure, then a recent shot after it’s undergone a generation or more of renovations. it’s fascinating to see how the original structure is still underneath it all, holding its basic shape even if an initial glance makes it look like a new building. I love that book! In fact, it was an instigating force in my decision to study architecture. Theory and I had once had a discussion about designing a virtual building with scripted components that change ever so slightly every time an avatar passes by. In this way, the avatar movement in the building over time would essentially ‘carve’ the architecture the way water gradually carves into stone. It isn’t feasible yet, but another interesting opportunity in virtual worlds will be to ‘play back’ the history of a site. It would be a great expansion on a simple ‘save’ function and would allow you to see how a building has shifted shape over time, or shapes up as it is being designed. Or maybe prims that change hue slightly in correspondence to their age – older prims are slightly more gray – newer prims are more saturated. That way, you could always see what’s left of that original skeleton.